Hot chocolate is a classic pick for winter. But there are so many more creative ways to serve it than in a packet — like on a stick (get the tutorial here). ...in an ornament (get the tutorial here). ...in a jar (get the tutorial here). ...or in a test tube (get the tutorial here). Want a favor that your guests will definitely use? Provide something that'll keep them warm through these frigid months, like gloves. There’s no better way to warm up on a cold winter night than with a hot bowl of hearty soup. Have a famous family recipe? Package up the dry ingredients and attach the cooking instructions. Not only is this adorable, but it’s practical, too. These pinecones are dipped in beeswax, which helps get the flames rolling in the fireplace on a cold winter night. Get the tutorial here. Bonus: Add a colorful surprise with the right kind of salt (Epsom = white flame; table salt = yellow flame; salt substitute = violet flame). Keep guests warm the old-fashioned way — with a bit of brandy. Opt for a crowd-pleasing assortment of mini bottles for your 21+ guests. Getting married on New Year’s Eve? Mini champagne bottles are a must-have. Add a glamorous touch by coating the bottles in glitter. For a festive twist, infuse vodka with flavors of the season (like cranberry). Get instructions here. Try a new take on a classic holiday flavor, like these eggnog lollipops. S’mores are perfect any time of year, of course, but this fun winter twist requires no toasting – and we love the snowflake marshmallow! (Get the recipe here). Wrap up a gingerbread cookie for each guest. Winterize the ever-trendy macaron by topping off each with a cute edible snowman. Get the tutorial here. Cake pops are popular DIY favors. Winterize them by using white chocolate and rolling each ball in sugar crystals before the chocolate dries – they’ll look like mini snowballs! Get the tutorial here. Guests of all ages will love these chocolate-covered pretzels. This eco-friendly favor is so cute — guests just sprinkle the seed-embedded snowflakes outside, and flowers will grow! Sugar scrubs are perfect for softening dry winter skin. This peppermint version smells like Christmas in a jar. Get the tutorial here. This snowflake soap is almost too pretty to use. Your guests will combat chapped lips in style this year with personalized lip balm. Mason jar snow globes are a cinch to make. Create a wintry scene, or fill them with meaningful trinkets. Get the tutorial here. 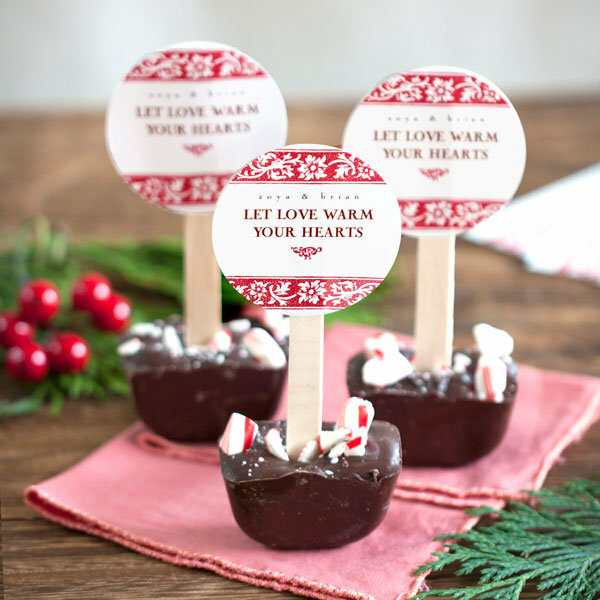 Guests will love this personal touch — gather an initial mug for each guest, and fill them with seasonal candy (like peppermint bark). You can't go wrong with a pretty snowflake candle. These beautiful place card holders will look equally gorgeous dressing up your guests’ Christmas trees. Help guests get ready for Christmas morning or a New Year's Day brunch with maple syrup. These tea cones resemble Santa hats — too cute! Let your guests decide if they’ve been good or bad this year – or have some fun of your own playing Santa and assigning everyone a role. Fill the naughty bags with chocolate “coal” candy and the nice bags with your favorite treat.